Professor Chris Southgate trained originally as a research biochemist. 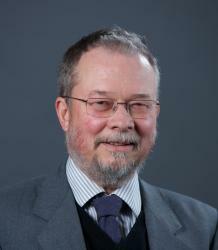 He has taught for the Dept on the science-religion debate (and related areas such as environmental ethics) since 1993. His research interests include the problem of suffering in evolution, the concept of glory in the natural world and in religious poetry, tragic events affecting church congregations, and the science of the origin of life. Chris teaches the undergraduate modules 'Evolution, God and Gaia' and 'God, Humanity and the Cosmos’. He has three postdocs and five research students at present, and welcomes enquiries from others interested in his areas of expertise. Chris's book 'The Groaning of Creation: God, Evolution and the Problem of Evil' was published by Westminster John Knox Press in 2008, and has become a seminal work on suffering in creation. He is also the editor of 'God, Humanity and the Cosmos' (Continuum, 3rd edition 2011), a standard text in the science-religion field. His new book is 'Theology in a Suffering World: Glory and Longing' (Cambridge University Press, 2018). Chris is also the author of eight collections of poetry, the most recent being 'Rain Falling by the River (Canterbury, 2017) and 'Chasing the Raven' (Shoestring, 2016). For more information see Chris's website www.christophersouthgate.org.uk. The interaction of evolutionary theory with Christian theology. The origin of life as a problem in science, theology and philosophy (see interpretationandcooperation.org, funded by the John Templeton Foundation). Environmental ethics in relation to Christian theology. The poetry of T.S. Eliot, G.M.Hopkins and R.S.Thomas. The concept of 'glory' in the Bible and tradition. Chris has a long-time collaboration with Dr Andrew Robinson, Honorary University Fellow in the Dept. Robinson and Southgate were one of only two teams in the world to gain all three rounds of funding in the Science and Transcendence Advanced Research Series (www.ctnsstars.org). The third phase of STARS included a collaboration with Professor Niles Lehman (Portland State, USA) on origin of life research, as well as work with Professor Terrence Deacon (University of California at Berkeley) on anthropology. Chris is working with Dr Meg Warner, the Revd Canon Dr Carla Grosch-Miller, and the Revd Hilary ison, on a project on tragedies in congregations, funded by the Templeton World Charities Foundation. Chris is also the Principal Investigator on a new project funded by the john Templeton Foundation on cooperation and interpretation in the origin of life, working with Dr Robinson, Ms Kavita Matange at Portland State, and Professor Sara Walker at Arizona State. I am open to receiving research proposals in the areas of the sciences' dialogue with Christian theology, environmental ethics, practical theology for ministry, and the interface of poetry with theology. the 2016 Gowland Lecture on science and poetry. "Information and the Origins of Life', with Andrew Robinson. £196,562, Science and Transcendence Advanced Research Series, made possible by the Templeton Foundation, 2008-2011. "Ministry Training as Formation", with Mike Higton. £93,000, St Luke’s College Foundation, 2007-2010. "Texts of Land, Sea and Hope", with Mike Higton and David Horrell. £67,656, SWMTC, 2006-2009. Chris has given presentations to groups concerned with the dialogue between religion and science, the interface between science and environmental ethics, and the interaction of poetry and science. My teaching style emphasises high levels of student interaction. Student-led seminars (including debates, etc) are a particular feature, with the aim to teach students not just how to think but how to talk and to listen as academic theologians. I won Templeton Foundation Science and Religion Teaching Awards in 1996 and 2000 and am a Fellow of the Higher Education Academy. I gave a presentation (with a former student) of good pedagogy in science and religion at the American Academy of Religion in 2016, and contribute regularly to the University's teaching abnd learning training. Two of my former students reflect on my teaching in articles in the journal 'Zygon', for September 2018.